ISB’s Middle School features a challenging and inspiring curriculum, grounded in an inquiry-based program that incorporates math, science, humanities, languages, the arts, and social studies. Teachers use real world contexts within core subjects to encourage students to experiment and seek deeper answers. For example, math skills are taught both as stand alone concepts and also linked to everyday problems and situations, giving students the opportunity to generate solutions as part of a relatable learning experience. Science class is lab-based, and students learn by doing and experimenting. Students can enroll in either of two tracks, French or Spanish, each of which offers a balanced and intellectually demanding academic curriculum. 6th Grade: Language and Literature examines the various ways students connect with literature in their role as reader/audience, writer/creator, and editor/thinker. In each unit they use text(s) - whether short-story, poetry, novel or nonfiction - to investigate an author’s craft and model their own use of it. As an introductory course into the MYP program, and in an effort to prepare our students for the upper middle school years, the class concentrates on the writing process and literary analysis. The objective of the course is for each student to find his/her own voice and feel capable of expressing his/her ideas. Students will also begin building their writing portfolios in 6th Grade, which is an ongoing process throughout the Middle School English curriculum. Works studied in 6th Grade include: Freak the Mighty, Rodman Philbrick; selected short stories; Beowulf: A New Telling, Robert Nye; Summer of My German Soldier, Bette Greene; Wednesday Wars, Gary D. Schmidt. 7th Grade: Seventh Graders continue to improve their skills in literary analysis. The texts for this course have been carefully selected as avenues for rich discussion, deep inquiry, and evidence-based writing. Students will also be introduced to vocabulary words, writing formats, and test-taking skills that help to prepare them for the high school application process. Works studied in 7th Grade include: Rocket Boys, Homer Hickam, Jr.; selected nonfiction articles and short memoirs (David Sedaris, Stephen King, and others); selected Short Stories ("The Fun They Had", Isaac Asimov; "Harrison Bergeron", Kurt Vonnegut, Jr.; "Marionettes, Inc.", Ray Bradbury; "Robot Dreams" by Isaac Asimov, "Super-Toys Last All Summer Long", Brian Aldiss; "The Veldt", Ray Bradbury); choice of science fiction novels (1984, George Orwell; Audience for Einstein, Mark Wakely; The Martian Chronicles, Ray Bradbury; and others); Lord of the Flies, William Golding. 8th Grade: In 8th Grade, students continue to develop the reading, writing, and critical thinking skills that will be necessary in high school, college, and beyond. The texts for this course have been carefully selected as avenues for rich discussion, deep inquiry, and evidence-based analysis. The class specifically focuses on preparing writing samples that will help students build their high school application portfolios. Works studied in 8th Grade include: A Midsummer Night's Dream or Romeo and Juliet, William Shakespeare; selected short stories ("The Scarlet Ibis", James Hurst; "The Rules of the Game", Amy Tan; "The Cask of Amontillado", Edgar Allan Poe; "The Interlopers", HH Munro; "The Gift of the Magi", O. Henry; "Thank You, Ma'am", Langston Hughes; "Lamb to the Slaughter", Roald Dahl); selected poetry (William Shakespeare, E.E. Cummings, Walt Whitman, Lewis Carroll, Edgar Allan Poe, Basho Matsuo, Edwin Arlington Robinson, Robert Herrick, and others); Animal Farm, George Orwell; Of Mice and Men, John Steinbeck. 6th Grade: Spanish/French Language and Literature examines the various ways students connect with literature in their role as reader/audience, writer/creator, and editor/thinker. In each unit they use text(s) - whether short-story, poetry, novel or nonfiction - to investigate an author’s craft and model their own use of it. As an introductory course into the MYP program, and in an effort to prepare our students for the upper middle school years, the class concentrates on the writing process and literary analysis. The objective of the course for students to find their own voices and feel capable of expressing their ideas. Selected readings from 6th Grade French: Inconnu à cette adresse, Kathrine Kressmann Taylor; Les Fées, Charles Perrault; La boule noire, Thomas Owen; La cafetière, Téophile Gautier; Le tableau, Jean Ray; La gloire de mon père, M. Pagnol; L’assassin est au collège, Marie-Aude Murail. Selected readings from 6th Grade Spanish: Paradero desconocido, Kathrine Kressmann Taylor; No pidas sardina fuera de temporada, Andreu Martín y Jaume Ribera, M. Pagnol; selección de Rimas y leyendas, Gustavo Adolfo Bécquer. 7th Grade & 8th Grade: These courses continue to help students develop analytical reading, writing, and fundamental language skills (grammar, spelling, conjugation and vocabulary) at a native level. Students broaden their writing and comprehension skills while continuing to apply their critical thinking skills by analyzing texts. Through a wide variety of texts and assignments, students explore the characteristics of different genres. Selected readings from 7th Grade French: Le Royaume de Kensuké, Michael Morpurgo; Vendredi ou la vie sauvage, Michel Tournier; Yvain le chevalier au lion, Chrétien de Troyes; Le Roman de Renart, Collective; Le Grand Meaulnes; Knock, Jules Romain; Le Médecin malgré lui, Molière. Selected readings from 7th Grade Spanish: La ciudad de las bestias, Isabel Allende; El caballero de la armadura oxidada, Robert Fischer; Relato de un náufrago, Gabriel García Márquez; 20 poemas de amor y una canción desesperada, Pablo Neruda. Selected readings from 8th Grade French: L'Enfant d'Hiroshima, Isoko et Ichirô Hatano; selection of letters from different time periods, including Madame de Sevigné and Zola; Un coeur simple, Gustave Flaubert; Un mariage d'amour, Emile Zola; Au Bonheur des dames, Emile Zola; Jeannot et Colin, Voltaire; Le monde comme il va, Voltaire; selected texts from the Enlightenment (Montesquieu, Rousseau, Diderot); Antigone, Jean Anouilh and excerpts from Antigone, Sophocles. Selected readings from 8th Grade Spanish: El reino del dragón de oro, Isabel Allende; Momo, Michael Ende; Crónica de una muerte anunciada, Gabriel García Márquez; Déjame que te cuente, Jorge Bucay; La casa de Bernarda Alba, Federico García Lorca. 6th Grade: 6th Grade provides the foundations for learning middle level mathematics. Students are introduced to the new mathematics assessment criterion, along with project and problem-based learning. Students gain not only understanding of mathematics concepts, but also the skills to apply what they have learned to real life contexts. Topics covered in 6th Grade include: Arithmetic (Fractions, Factors, Multiples, Percents, Ratios), Pre-Algebra (Expressions, Properties, Roots, Absolute Value, Integers), Linear Equations and Slope (Variable, Equation, Substitution, Function, Slope), Inequality and Absolute Value Equations (Inequality, Absolute Value), Arithmetic Number Sense Ratios/Rates (Ratios, Equivalent Ratios, Rates, Fractions, Percents). 7th Grade: Students learn problem solving and mathematical reasoning. They learn to communicate and reason mathematically in real life situations. They begin to see mathematical connections between New York State Standards and IB objectives and aims, which are taught throughout the year. Topics covered in 7th Grade include: Number Sense (Ratios, Proportions, Fractions, Percent), Algebra (Simplifying Expressions), Algebra (Relationship between two variables), Algebra (Systems of Linear Equations, Polynomials), Geometry (Pythagorean Theorem, Distance and Midpoint Formulas). 8th Grade: As the final year of MYP mathematics, 8th Grade mathematics is a course designed to get students ready for the rigors of high school. Students investigate and build mastery of algebraic principles and relationships in contexts related to real world mathematics, research, presentations, and traditional assessment. Topics covered in 8th Grade include: Number Sense with Rational and Irrational Numbers (Real Numbers, Negative and Positive Integers), Algebraic Functions (Functions and Non-Functions, f(x) formula), Polynomials (Polynomial, Binomial, Trinomial, Like Terms, FOIL Distribution), Relationships Between Two Variables (Variables, Functions), Radical Expressions (Root, Radical, Radical Expressions), Quadratics (Quadratic Formulas, Discriminant, Factorization, Solution, Vertex). 6th Grade: Science is a laboratory/experimental course. Throughout the year, the students have the opportunity to hone their laboratory skills, learn to analyze data, draw conclusions, and find ways to improve their work through reflection and discussion. 6th Grade science encourages students to think critically, to solve problems creatively, and to demonstrate an understanding of basic science concepts. The scientific process is taught through explorations of Life Science (Biology) and Physical Science (Physics and Chemistry). 7th Grade: This course explores Chemistry, Physics, and Biology through an integrated hands-on-approach. Students are encouraged to make connections between scientific concepts and their uses in everyday life, from the physics of forces and the application of these concepts to simple machines to the physiology of the human body. 8th Grade: This course explores the Chemistry, Physics, Biology, and Earth Science through an integrated hands-on-approach. Students are encouraged to make connections between scientific concepts and their uses in everyday life. 7th Grade: In the second year of Middle School, students continue to learn and analyze the details of our world’s past and present. Classes use the facts of history as a starting point for inquiry, discussion and critical thinking. Students begin to consider the ways in which citizens of the world interact with their societies in an attempt to cause change. Students then apply this new understanding to the world around them. 8th Grade: In students’ last year of Middle School, teachers challenge them to continue applying the skills they have learned previously at ISB. They are asked to think critically, inquire deeply, and make connections between past and present. Teachers work to prepare students for the rigors of high school by giving them opportunities to consider new perspectives, work on note-taking skills, engage in discussions, and further develop their strong research skills. 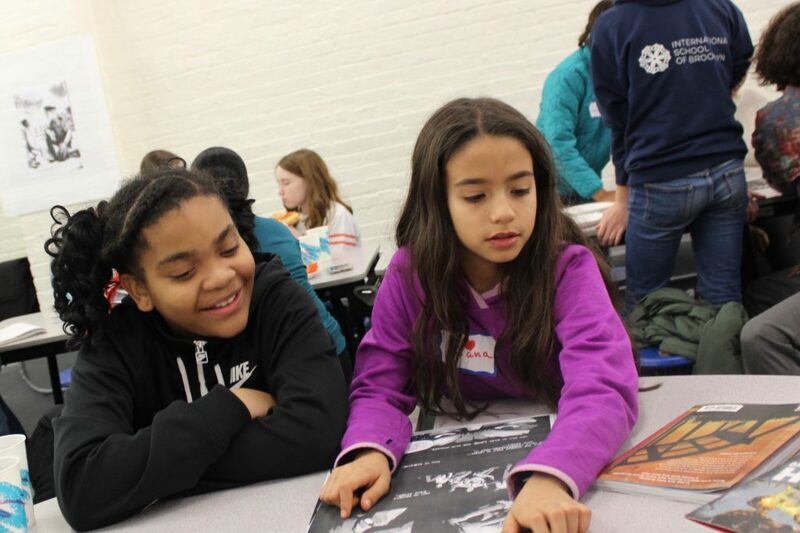 Language Acquisition class introduces ISB Middle Schoolers to a third language (for bilingual track students) or to a second language (for monolingual students) using ISB’s highly effective language immersion approach. The curriculum covers communication strategies, grammar skills, spelling, and vocabulary through a variety activities, including songs, listening activities, fiction and/or non-fiction writing, and role-playing (skits). The primary aim of Language Acquisition is to encourage students to gain competence in a modern language other than their mother tongue or target language. Language Acquisition classes also encourage respect for and understanding of other languages and cultures, in addition to providing the skills that facilitate further language learning. Learning another language greatly contributes to the holistic development of students at ISB. It gives students access to a broader range of input, experiences, and perspectives, as well as the ability to communicate in a language other than their mother tongue or second language. ISB’s physical and health education classes aim to empower students to understand and appreciate the value of being physically active and motivate them to make healthy life choices. Through physical and health education, students are encouraged to appreciate and respect the ideas of others and to develop effective collaboration and communication skills. These skills help students to develop a sense of social responsibility, and self-respect. Physical and health education also provides students with the opportunity to understand the need for physical fitness. Students learn recreational activities that can be enjoyed for a lifetime. Students will see the value of lifetime activities as a way of developing self-confidence and in taking pride in their accomplishments. Students develop motivation to make healthy life choices. Throughout the ISB experience, students study different units of physical activity in the PE Program. Invasion games include team handball, soccer, and Tchoukball. For individual sports, students participate in swimming classes at the local YMCA and run track at local fields in Red Hook. Students also have opportunities to express themselves through aesthetic movement, which includes Modern dance, Acrogym, and Latin dance. In ISB’s newly built gymnasium, students are able participate in various other physical activities and engage in team sports such as basketball. The Middle School Visual Arts curriculum strives to create an environment where students can develop their creativity, art making skills and conceptual understanding of the subject. Students keep a process journal where they can design, reflect on their own creative process, and analyze the work of professional artists. Students are encouraged to find their own aesthetic voice through the exploration of various media, including wet, dry, and two and three-dimensional materials. The Middle School Performing Arts program expands upon the music and choral skills learned in the Lower School, while introducing the topics of theater and the performing arts. Students explore theater through examining its history and creating their own monologues, plays, and performances. They also learn the techniques and skills of technical theater, improvisation, comedy, and performance. Students perform in the school-wide winter concert and have multiple performance opportunities in the spring semester. In Design class, students are presented with a design problem to which they identify their own solutions. They are encouraged to explore multiple solutions to creative challenges and help each other (with teacher guidance) to achieve technical and conceptual understanding of the statement of inquiry for each unit. The design cycle model underpins the creative process and will be used as the structure for all design projects. The process is divided into four stages: inquiring and analyzing; developing ideas; creating the solution; evaluating. The design cycle is an iterative and cyclical process because solving design problems is not always a linear process. Students in the English/French and English/Spanish programs all benefit from ISB’s bilingual learning environment. Bilingual Students Students who enter ISB in Lower School or who are already bilingual when they join ISB will continue to build mastery in their target language in Middle School, while also beginning to study a third language. Monolingual Students Monolingual students who enter ISB in 6th Grade benefit from the school’s immersion environment as well. They spend eight periods per week (over 20% of instruction time) in French or Spanish language instruction, supported by an educational environment in which they are surrounded by native-speaking and bilingual peers. This program has enabled these ISB students to place into higher level second language classes when entering high school. Community Service As part of the Middle School program, students are required to engage in at least ten hours of community service per year. The culminating project is the MYP Project, where students look at a global issue that affects people locally, then plan and carry out a community service project surrounding this issue. 8th Grade concludes with a presentation to the community about the experience. Expertly Expressive Students use writing, research, and technology tools to develop the critical communication skills needed to navigate a global society. Diversity ISB fosters intercultural and community awareness through the curriculum and encourages each student to explore his or her own identity. Technology ISB’s curriculum focuses on technological literacy and responsibility and features a 1:1 laptop program. Holistic Approach to Teaching and Learning Classes and activities are designed to meet the academic, social, emotional, physical, and artistic needs of students. Advisory Program Students meet with their advisor daily. The program is designed to support students throughout their three years in Middle School and to give them the tools they need to be successful after leaving ISB. ISB also provides comprehensive support and substantial resources to help Middle School students and their families with the high school application and placement process. Did you know that George O’Connor’s graphic novel series, The Olympians, is the most popular series in the ISB Library? 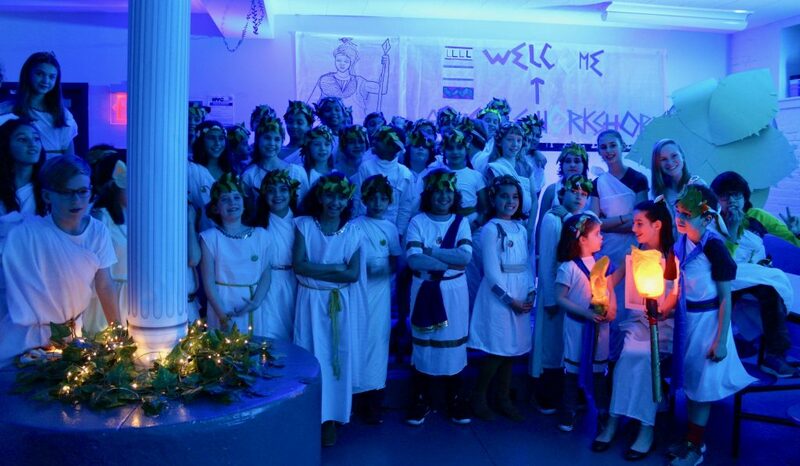 This inspired the Library team and the Middle School Booklets Club to host an immersive extravaganza that would transport 4th Graders to Ancient Greece! 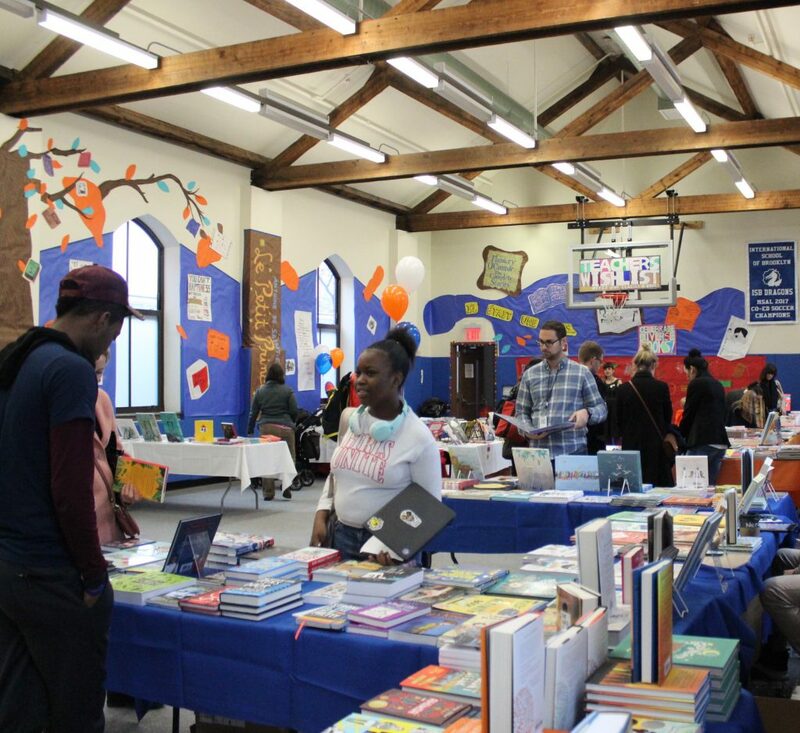 Amid the frenzy of Election Day and Parent Teacher Conferences, the ISB community came together to transform the gym for the 14th Annual Multilingual Book Fair: a forest of enticing French, English and Spanish literature, and to celebrate Literacy Week. The enthusiasm for the events stretched far and wide.